When you think of polluting industries, visions of fossil fuel guzzling turbines and earth-churning machinery probably come to mind. But the clothes on the racks in your local shopping mall are just as dirty when it comes to environmental damage. 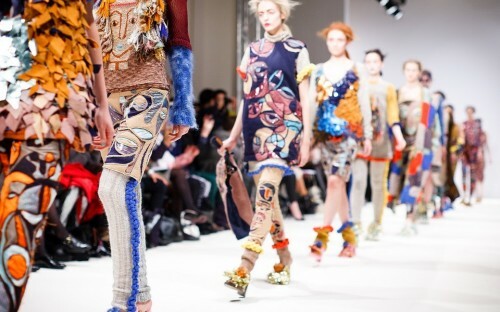 In fact, after oil, the fashion industry is one of the most polluting in the world—looks really can kill. When you start to tally up the environmental costs of growing cotton—and the pesticides, herbicides, and oil-powered machinery involved—you start to get an idea of how those mass-produced clothes aren’t as ‘clean’ as you’d hope. This is before any transportation or factory manufacturing has occurred. It was this discovery, along with a love of sustainably handmade products, that led three MBA graduates from Hong Kong’s CUHK Business School —Fritz Lin, Rongxin He, and Raymond Tang—to create their startup TOUCHEU, Asia's first sustainable handmade fashion and lifestyle marketplace. Fritz first came to understand the fashion industry’s dirty secret while travelling through fashion centers in Suzhou, China, Paris, and Florence. “Mass production is good from a business perspective, but it’s detrimental to the environment and our wellbeing—most people are not aware of the impact they're making from their lifestyle,” Fritz explains. This sentiment was shared by Rongxin. “I saw the unique value of handmade products, not found elsewhere, that triumphs over mass-produced goods. Hence, the founding of Toucheu,” she says. For both budding entrepreneurs, joining the CUHK MBA was a decision based on its strong reputation, ranking, and its education on business in China—the school’s MBA program is ranked first in Asia and, with its 50-year history, has the largest alumni network in the region. Fritz explains: “Firstly, the MBA gave me credentials. CUHK is a highly-respected university in Greater China and overseas. This has gained me trust and respect from my business contacts, partners and associates. While it’s early days for their company, Fritz, Rongxin and Raymond are working hard to make sure their online platform stands the test of time and becomes a big player in the market. The throwaway nature that these grads are looking to change stretches from East to West. Determined to have an impact across the globe, there seems to be no better place to have studied an MBA than at CUHK Business School in Hong Kong. “Hong Kong, a melting pot of East and West, is definitely the perfect destination to study and experience,” explains Rongxin. market about sustainability and wellness.